Each day at 10am PST, from December 1 to 24, we will celebrate Blocks That Matter‘s community by featuring excellent user levels. And we will also celebrate Indie Games in general by giving you the opportunity to win great games offered by generous indie developers. To learn more about the featured BTM community levels and how to enter everyday’s contest, simply click the picture below and get ready to make your social networks burn. Anyway, I’ll make a post this week. But you’ll see that the release date of Seasons is still “when it’s done”. I TOLD YOU I’D KEEP YOU TO IT! IT’S BEEN TWO WEEKS INTO THE NEW YEAR AND STILL NO MENTION OF SEASONS AFTER FALL!!!!! At the very least, I certainly played a lot more levels that I would have avoided previously, haha. Thanks to everyone! I think the \perfect\ design of the website doesn’t help. Well, now you’ve seen the list. Oh, now I feel foolish. Perhaps I only saw the abbreviated version on the front page, or the part below the #comments… this is indeed what I wanted. 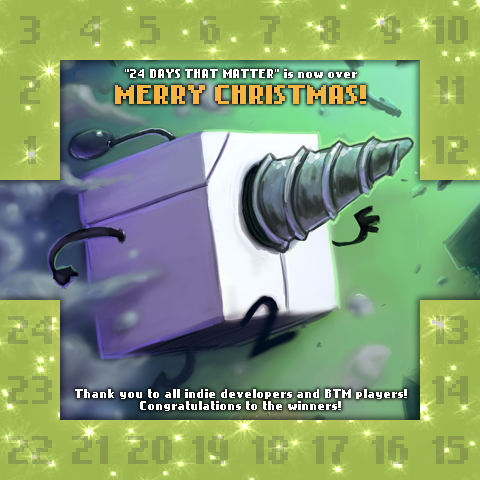 The list of the 24 community levels featured during the event is here, in the post. Now you only have to read it here or to go play the levels directly in the Community Section. Click the “FEAT(ured)” tab to display them all. Is it what you needed? Now that this is done, can we get a single post with all the community featured levels in it? That way I don’t have to click through 24 posts to figure out which ones I didn’t get around to playing/beating. Thanks! One last thing, Can you please upated us on the sales for XBLIG. It did well in france?, But bad in England and America?. Thank you William and Guillaume and the rest of the SSS team. I look foward to seeing your games (Maybe BTM:2) on XBLA marketplace. Keep up the great work. We haven’t answered all comments here but I wanted to say to you, players and level creators, that we read them 🙂 Thank you for your feedbacks and discussion about how we can improve BTM. Lol, don’t feel bad. I know my levels are not for everyone. I’ve played this game so much myself that movement-wise most things seem effortless to me. I still struggle with some of the harder edge jumps though because those particular collisions are quite tight in this game. But let’s face it, some puzzle elements are simply not possible without using the basic edge jump so I doubt I’ll ever stop using that one. I consider it to be one of the basic skills to master. I fail that jump many times myself, but it’s not a big deal when the levels are as short as they are. I’ve already started making “easier” levels based more on puzzles which don’t require such high platforming skills. Most of them are still under construction. I uploaded what’s probably the easiest one just now (Smooth Exchange). I do feel a bit awkward when these “conceptual” or “demonstrative” mini-levels are featured here. It’s a bit funny to see them put on a pedestal like this, lol. “Heartburn” for example is basically just a demonstration of the magnet glitch which I built into a half-assed annoying mini-level. Even “Tap Dance” was featured (not on this particular event, but still) and it was a total joke, haha. Young map makers have no sympathy for old, slow-reacting gentlemen like myself, haha. I managed to collect all four blocks once, but died in the corner trying to leap over the fire. KryptoN! Your levels are so difficult for me. It’s like you’re … I dunno, some *thing* against which I am powerless. You know? Like, how everyone has something they are weak against? There’s probably a word for it. I think the pause menu would be the perfect place for it. *Completely* out of the way, unobtrusive. KryptoN, you are a genius (even if I _can’t_ ever beat your levels, haha). And so on… These could of course be presented in a neater graphical way instead of plain text. Putting “helpers” inside the level with the text object feels rather tacky. Just noticed, a huge part of my previous comment is missing, haha. Probably because I had made a heart after saying Oh FFiZ (ascii hearts use the less-than sign, same as opening an html tag). So everything I wrote between that and my angry face (starts with the greater-than sign, same as closing an html tag) never got posted. I was complaining (as usual, haha) about having to guess things, and how much I hate that. There don’t seem to be any indicators anywhere of what Buster’s capabilities are in each community level, so I was SURPRISED after solving the sudocube that CRYSTALS WERE UNBREAKABLE. I trapped myself after beating the puzzle part, because that was unexpected. We have to *GUESS* what Buster’s abilities are. Angry face! I replayed Trick or Treat trying for the BTM. I failed to get the BTM (I think I am incapable of precision-jumping), and when I quit the level, my vote from previously finishing it was gone. I was trying, unnecessarily, to gather more blocks. I see now that there’s no star for that level anyway, haha. I trapped myself for nothing! As for Trick or Treat… I’m not as familiar with the chocolate slimes (I had trouble with the chocolate update, being colorblind, so I don’t have as much experience with them). They’re not like fire slimes are with wood. So, I’m learning a lot, haha. Still, it’s another level with annoying guessing. What’s in the boxes? Have to get to it to find out, sometimes requiring a restart after. ANNOYING! The obsidian block has to be used earlier, if that’s not too much of a hint. I had to play it twice. The first time, I ended up how it sounds you did, in an empty chamber carrying a single obsidian block that I couldn’t use because you need 4 blocks to place anything. I didn’t have a problem with that part of the puzzle, what I had a problem with was having to *guess* how to open the final lock. It’s not indicated _anywhere_. The single-obsidian-block part, and it’s solution, would have been GREAT in *any other level*. But it’s tied in to how to open the final lock, and again, I can’t stress this enough, there’s NO indication how to open it. THAT was the part that bothered me so much in an otherwise great level. Yeah, I agree the ending was unfair and bad ;p When I played it I was even trying to figure out the purpose of the additional obsidian block, but didnt figure out it’s purpose. Oh man, Sudocube was on track to be my favorite level ever until the horrible end. Having to GUESS (eg, “what happens if I do _this?_”) after a purely logical main puzzle ruined it. The main puzzle was enough on its own, it didn’t need that ending. 1A: I meant, keep the current voting system and supplement it with a second system for people who haven’t beaten the level. Definitely don’t replace the current system, because if you could only have one, that’s the better one, but I feel it is an incomplete picture. So a level would have 2 scores, one by people who have beaten it, and one by people who have given up. This gives you more information than either score on its own. If a level has lots of Win upvotes and few Surrender votes, you know it was fun but not challenging enough to drive people away. If it has positive Win votes but many many Surrender votes, then you know no matter what that it is a challenging level. What we lack right now is a way to see how many people played and failed a level. 2: No, not a set “par” time for the level, the average time needed to beat it. If the game kept a timer as you played, it need only add that time to its running tally and increment the number of players that beat it. Display the tally divided by the winners gives you the average time. Each level stores upvotes and downvotes, this would just be two more data fields. The question would be, keep track of the last life or the whole time the level was open? 3: I would have said, if the comments were stored with the level rather than in the forums, the comment couldn’t be *more* than a fixed number of characters, like a tweet. Something small and easily stored. 255 characters or something. That’s plenty, you don’t need a detailed in-depth comment, there are the Steam forums for that. But, Tector is right about spam and insults, which is why I suggested the Steam forums, which already have safeguards against that kind of stuff. If there were a way to even directly *search* for the current community level in the BTM forums, that would go a long way. People could comment there using the Steam-browser without leaving the game, including levels they surrendered on. The only change would be what the ‘Y’ button does, go to the Steam group or to the forum. 1b: hm, i don’t like the idea to reset the vote count because after changing a level several times i assume that the majority who has voted before would not play it again… but i see definitely a need for a level version number (just an incrementing number each time the level is updated). this would not solve the problem that you can change the whole level – but how can the game itself recognize if it is a small correction or complete remake? 3: yes, i miss that feature too. but i think you have to earn the ability to comment on a level… some restriction like ‘beat the level 3 times’ or ‘beat 3 user level to give 1 comment’. so i think it would not flooded by useless comments and players have to consider what the want to say… also a comment should be at least 100 characters long or sth. like that. 1A. A way to vote on levels you haven’t beaten, ideally as a separate vote from people who *have* beaten it. Right now, the only score that matters is those that have beaten it, but as I mentioned before, you can vote repeatedly on a level, each time you beat it. SO, _if_ it’s set up so that the level creator cannot vote on their own levels (I’m assuming), one would only need to show a single friend how to beat it in order to get voted up. I just downloaded a level, and it was ridiculous. It just went on and on, it would probably take more than an hour to play through it. I wish I hadn’t downloaded it. The average time taken to play through a level. Or, the level size. I want to know what I’m getting into beforehand, ESPECIALLY for levels where they turn off the camera. OH how I hate not being able to see the rest of the level. HOW CAN I PLAN?! Grrr. Anyway, an indication of the time-investment needed to play a level would be nice. The ‘Y’ button takes you to the Steam-browser and points you to the game’s group, would it not be possible to set up an automatic forum post for each community-made level? Then the ‘Y’ button could take you to the relevant post for the level you are in. Then the ‘Y’ button would have a functional purpose! I know, I know, I dream… I’ve just had a frustrating round of community levels, and these are the things that occurred to me. Raszlo! Don’t take this the wrong way, but you’re awesome and I love you. SHIFT?! I never would have thought to try that. I am not a clever man, haha. 1. It’s full jump always, height(jump strength) can be only changed level-wise in the editor. 2. When creating levels, how does one enter numbers? The number buttons on my keyboard do nothing, which is bad if I’ve deleted the old number (pressing enter when there is no value entered crashes everything). Is it numberpad-only? My keyboard has no numberpad. 3. Any chance of colorblind-friendly slimes for the chocolate levels? For example, the dots on the slimes matching the dots on the blocks they affect? It’s not too hard to tell the difference between the dark-chocolate slimes and the white-chocolate slimes, but other than that, it gets confusing for those of us color-impaired, haha. Or maybe I just want to see a slime with heart-dots, haha. @Phoenix: thank you for loving my levels 😀 – concerning level 6: i think it is the hardest one of my levels, i will place a hint to make it easier for those who stuck… there is a thread in the steam forum concerning my levels where you can ask and/or give me feedback. so back to topic: Thank you for this event, swingswingsubmarine! As for the Tec’s level – red means it was reuploaded with changes. Being kicked to the main menu means the level is corrupted and must be reuploaded. The reason it turned gray is that it is red only until the first play. I should point out, it ALWAYS kicks me back to the main menu now when I select it, but just that one level. Now I can never play it again? So strange. @SwingSwingSubmarine: Something odd today. Went to community levels, and Tector’s Tecs Playground 10 was a different color and had a flashing exclamation mark on it. So, I selected that (because, what? ), and it looks like it was loading for a moment, and then returned me to the main menu. Not the community levels menu. Went back to community levels, and Tecs Playground 10 is gray again, as if I’ve never played it. What happened there? I hate jumps, Raszlo! I hate ’em! I recently did think about doing video walkthroughs for some of the community levels, if only because that’s something I myself would like to exist. I *could* do Let’s Plays of levels, but for some (like today’s) it would just be 10 minutes of me dying repeatedly at the very beginning. Do they allow cursing on YouTube? Me: Riddle Of The Lost Ark? I love riddles! @Raszlo, I have to wonder if your levels play differently on your computer. I’m trying to go through Gravity Insanity right now, and walking is too slow, but running throws me to the side of the level. It’s too fast to be controlled. Since the level seems to require some precision (I say “seems” because I certainly haven’t progressed very far), is this how it is supposed to behave? No no, I get the reference haha. I’m old-school, emphasis on the OLD part, which is why I get so frustrated by quick-reaction levels. My hand-eye coordination isn’t what it was 30 years ago. I meant, it’s annoying to have to exit out and reload the level if you mess up a jump and break a block you don’t intend to (can’t reach the higher blocks, not enough blocks to build a way up there, stuck). Sorry if I seem easily annoyed. If I didn’t care, I wouldn’t say anything. 😉 Raszlo, I do like how you play with the mechanics of the game, it’s just that the novelty of new mechanics isn’t as much fun to me as solving a puzzle is. I don’t want to have to fight with the game in order to play it. Hrmm, maybe I *am* an easily annoyed person! @Raslo, I’m playing your IDDQD level. Self-destruct is disabled? Most annoying thing ever. I’ll see what adjustment I’ll be able to do for a future update (the filters thing, and little features). Anyway, thanks you awesome creators! Not sure if this is a bug, but replaying a community level (in this case, Playground 8 to get that elusive green star) allowed me to revote. Tector! I love your levels (although I am having trouble with Playground 6, but I’ll figure it out eventually). Running into some minor annoyances while playing the community levels now. The filter disappears after you exit whatever level you’re playing, so if you’re trying to go through all of one person’s levels, you have to re-enter the filter EACH TIME. Annoying. No way to save filters? No way to see my levels from people on my friends list? Speaking of annoyances, the menu prompts are out of order. On the top, X is left and Y is right, just how it is in the Gamepad Setup screen, but on the bottom B is left and A is right, whereas in Gamepad Setup (and on the buttons themselves) A is left and B is right. So I’m constantly hitting A when I mean B as I navigate through the menus. Grr. And related to the buttons, oh how I wish Y didn’t kick me out to the steam Join Group screen. I’ve joined! I’m trying to un-pause! I already have 10 Join Group tabs open! I never did get that achievement either, no matter how many times I’ve joined/unjoined/rejoined… Why is there a dedicated button for this? @Phoenix: When I write “potential” BTM 2 it’s just because I prefer to be careful. But we plan to do it one day, of course. Tetrobot need more adventures, but good ones. Maybe it would be nice to categorize community levels in puzzle or platform type (or both)? so i can search for the type? Btw. : It seams that the editor was not supposed to be published in BTM but then it was so and so it lacks some features, is a bit unstable and is not user friendly enough i think (especially when typing texts or numbers)… there is room for improvement! Playing through a lot of the other community levels, it seems LOTS of people like the tough-as-nails twitch-response lotsa-death levels. Or at least, LOTS of people seem to like to *make* those kinds of levels. So, you have an audience there, haha. Just not _my_ cup of tea, personally. I don’t like spending 8 minutes slowly making my way across a map, careful careful, and then bumped by a fireslime and forced to start over. It makes me feel like I wasted my time. On the other hand, it took more than 8 minutes to solve Obsidian Lock (and many many attempts), and I didn’t feel like any of it was wasted. If the controls were tighter, the precise-jumping levels would be more endurable to those slow-of-hand like myself, haha. As it is, it sometimes feels more like luck than skill. Not that it has deterred me from playing (25 hours total so far, according to Steam). And what’s this about a *potential* BTM 2? Didn’t you end with To Be Continued? What do you mean, just *potential*?! I need more levels! The levels featured during this event are all made by users and there’s different style of levels. I have the same taste than you, I prefer puzzles than precise move, but I can’t assure you that there will be more puzzles than platforms, or more platforms than puzzles. For the record, I play BTM for the clever puzzles, not the precisely-timed one-false-move-and-you-die jumps. This isn’t Super Meat Boy. Here’s hoping the rest of the levels lean more toward the cerebral.